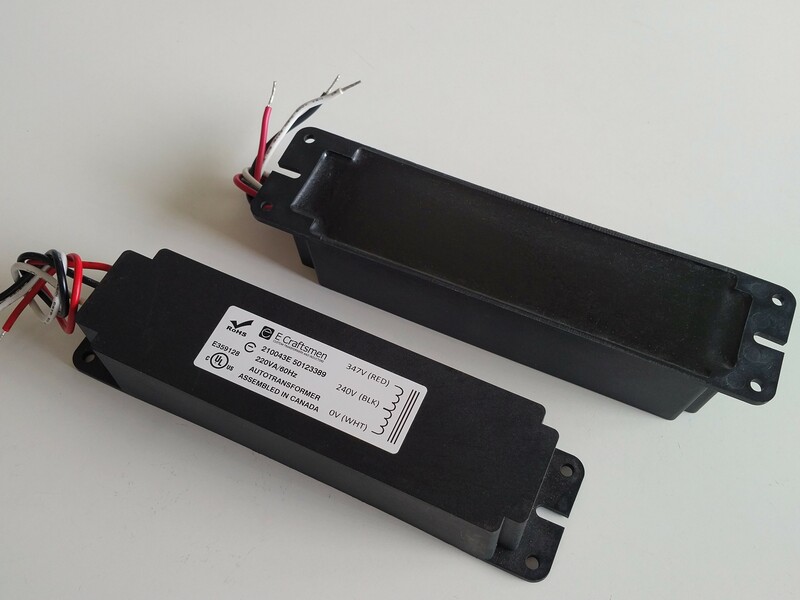 Enclosed High-Power External Mount Slim-Line LED Lighting Step-Down Transformers, UL Listed. ENCLOSED external mount sep-down autotransformers, Models 210043EB (shown), 210098EB & 210083EB. Same popular "Low-Profile" shape with overall dimensions 7.72"L x 1.87"W x 1.49"H. Fully UL Listed for Canada and the U.S. Suited for IP66 applications. FR530 "Rynite" enclosure (flammability rated UL V-0) and completely epoxy sealed for water resistance. Provided with integral mounting feet. Also available with an internal thermal protector - Model Suffix "FB"
See Slim Line table of models for further information.